Steve Savage has been in the business of designing custom cabinetry for the discerning homeowner since 1984. His company, Savage Designer Cabinets, is well established in the greater Sacramento area and has built cabinets for thousands of homes, and is noted for their visionary designs. Whether you are building or remodeling your home, cabinets have become a major focal point in the overall project. For instance, today’s kitchen has evolved from being a functional backroom in a home to a central focal point for today’s lifestyles. It is important to find a cabinet designer who can give you professional advice and expertise while adding beauty, value, and function to every room in your home. Savage takes his customers from the beginning. He works with the homeowner, contractor, and designer to bring together a virtual harmony of cabinets and design. Often his cabinets include arches, corbels, columns, and radiused cabinetry to achieve the furniture like quality that makes Savage Designer Cabinets so distinct. The customer decides on every detail before construction begins. The cabinets are of the highest quality, utilizing dovetail joints, and a face frame system. The doors and drawers can be flush (inset) with the frame, or a standard overlay. The cabinets can incorporate hidden storage in decorative columns, designed to accommodate wiring, lights, or plumbing, the possibilities are endless. Before cabinet construction begins, the job site is carefully measured and photographed. Then preliminary cabinet designs are drawn. All designs are carefully reviewed to make sure every aspect of the design package is up to Savage Standards. At this point we are ready to present the package to the customer in 3D, on a 42″ Plasma monitor. 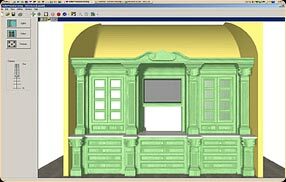 This way the customer can view the end product, for form, and for function, before they approve the cabinetry to be put into production. Lastly, our CACD technician, and Shop Foreman return to the job site to remeasure the entire package to ensure correct measurements and to make sure all changes at the job site have been taken into consideration before cabinetry is released into the shop for production. Cabinet construction begins in the company’s 46,000 square foot Rocklin facility. Savage Designer Cabinets has integrated state-of-the-art technology with old world craftsmanship. Each department is sequentially positioned allowing each employee to add their expertise to the cabinetry. The large Special Projects area is set up to construct such items as the intricate hoods, bars, entertainment centers, and radiused furniture cabinetry for which this company is recognized. Finally, the new cabinets are delivered and installed on the job site by a trained installation crew. Since custom designs require careful work and attention in order to achieve a great end result, it is recommended you make plans well in advance of your desired completion date. A key element is in the planning before construction on your project actually begins. Steve Savage has built his business and reputation around the customer and their total satisfaction.